Way back in January you might recall a story we ran about an up-and-coming independent developer by the name of Glitchbit and their first release: Tipsy Raccoons. The game has made appearances at arcade locations for testing as well as at a couple of trade shows in Vegas (one of which I was at but somehow missed them). The game grabbed headlines among amusement trade for coming up with a system that would allow you to insert drinks to pay for the game. With more feedback and testing further fine-tuning Tipsy Raccons, the game is now preparing to release to the amusement/eatertainment market. Some important changes have been made to it since we saw it in January – it is now a 4-player game instead of six; it also is not restricted to only taking drinks as payment (something that appeals to certain bar/arcades but certainly not all of them. Coin or Dollar Bill Acceptors can be added for locations that use the traditional arcade payment model. If a location wants to use just drinks, it has a specific setting called “Drinking Game Mode” which also affects the content; the Cash Only mode is appropriate for kids to play. Bars that want to do both can also do so. It sounds like they have expanded the number of mini-games (the quote is “dozens”) so I imagine that they included plenty that are age appropriate. This is another refreshing genre to see make a comeback – mini-game compilations (party games is probably the correct term; stuff like Panic Park) have been missing from the business for a while. Here’s a trailer of the game from a few months ago in case you missed that. Which brings up a good point (switching to commentary/opinion mode here) – 2018 is quite the year for 4-player-1-cabinet games. We’ve got this, Halo Fireteam Raven, Tomb Raider, Cosmotrons, Spins Ahoy!, and TMNT…so far. Rampage almost counts, being 3-player. This could reflect the stronger presence of bar/arcades out there and people rediscovering the social positives of playing on the same cabinet in such a manner. 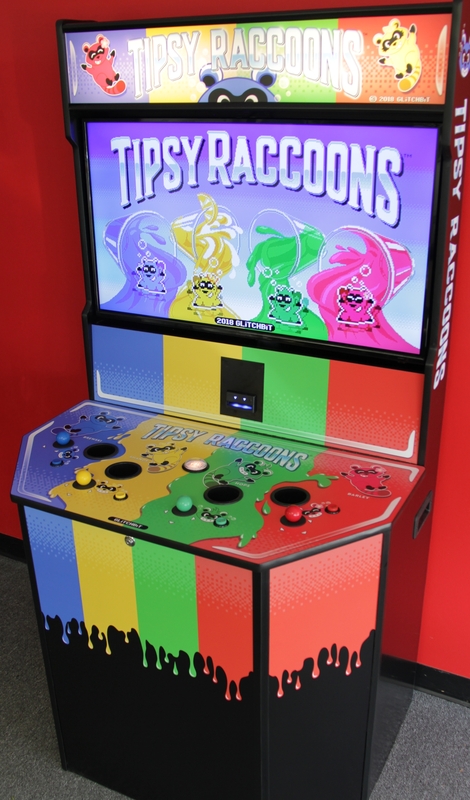 What are your thoughts on Tipsy Raccoons joining the arcade fray? I’ve played TR before and it is a solidly good experience. The social aspect is far and away the best part. Sort of a Warioware Drinking Game that is just as satisfying with a can of Coke. This one is really worth keeping an eye on. A risky concept for an arcade game. Usually people don’t want to learn a lot of sub-games.